Taxis are cheap but sometimes the driver will negotiate a fixed fare i.e. without a meter. The same is true with tuktuk wherein you need to negotiate first the price before agreeing. In our four-day trip here we encountered taxi drivers moonlighting as pimps with matching colorful brochures to boot. Ferries and boats, available at the banks of the Chao Phraya, are available for for sightseeing tours. 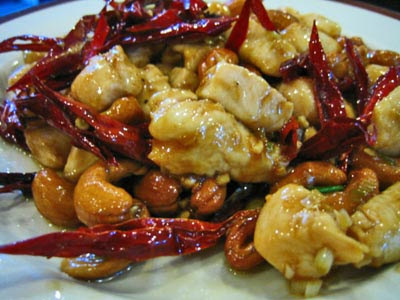 Chicken with cashew nuts and lots of chilis. a Thai delicacies store in MBK (Mah Boon Krong). You have to note that Thailand is also a shopping haven attracting hordes of liquid Filipinos addicted to shopping. One of the sidetrips we made was dinner at Jengor's Kitchen where our Malaysian friends from one vendor/supplier treated us to a sumptuous fare of seafood satiating ourselves as if it's our last night on earth. 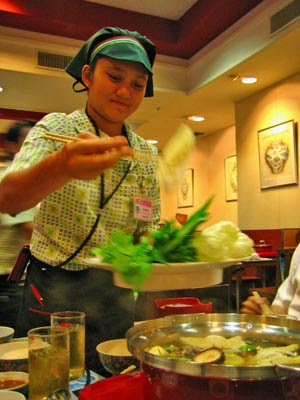 A memorable dinner I highly recommend is at the Baiyoke Sky hotel buffet where we treated ourselves to hearty dinner with an eclectic mix of Thai, American, Chinese and Asian food but sadly, as always, no Filipino food available. You may proceed to the viewdeck of the tower afterwards for a gorgeous view of nighttime Bangkok. For the more adventurous, you may try fried critters, locusts, lots of creepy crawlers even scorpions on the street (some I tried in my first visit) for an exotic gastronomic adventure. Bangkok weather is so much like Manila's and the streets remind me of Malate and Binondo. English is now more understood than on my first trip where we struggled to ask around at Chatuchak looking for a fruit stand (such a hilarious experience). When going out of your hotel, have hotel staff write down on a piece of paper your destination to show to your taxi driver to avoid confusion. Bargain with locals when buying things using broken english and a calculator to indicate the price. Thais revere their king so much that it's illegal to criticize their king or deface posters of him. It's also illegal to possess items related to the "The King and I." The king is printed all over the Thai baht bills and coins also. If ever I will find myself again in the Land of the Free, I would want to explore the cool north including Chiang Mai. waaaahh misskothai food. saSingapore kasi pag gusto namin kain thai food punta lang thai resto e..hmmnn parang mga pinoy taxi driver din pala mga cab driver sa thai ano? marami yang habal-habal sa negros kasya ata lima or anim eh.. I've always wanted to visit Bangkok but I wonder with all the random bombings, is it safe to be there now? I really, really wanna go there! Sounds exciting! Enjoy and be safe! ang di ko malilimutang kinain ko sa bangkok ay ang penang (some kinda beef with red curry). sobrang anghang smoke practically came out of my ears. woot! 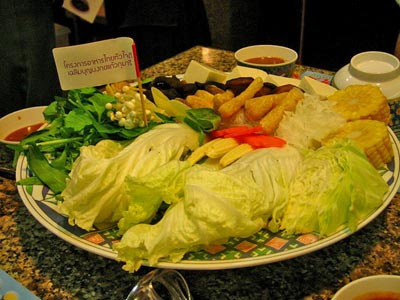 Have you tried eating in 'Cabbages and condoms" Great food, it's somewhere in Sukhumvit. Also in sukhumvit, there is this pricey indian/malaysian resto "Mrs. Balbirs" good food but a tad too pricey 700 baht! Ouch ! try to visit at least once. you'll love it. meron naman thai resto na dito. there's Oody's na in SM malls. 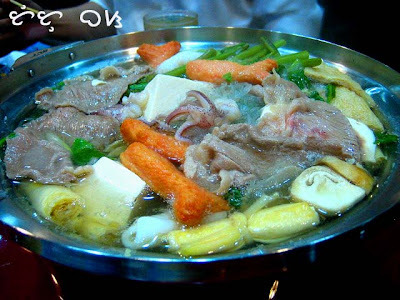 One of those i recommend to you, and frugal, is Som's on reposo in Makati and another near Kalayaan. There is (or was) a thai canteen near UP but don't know if it's still there. it's generally safe to be there. just stay safe anywhere you go. 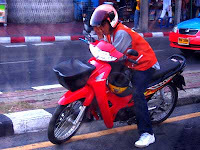 i have been to bangkok countless of times. 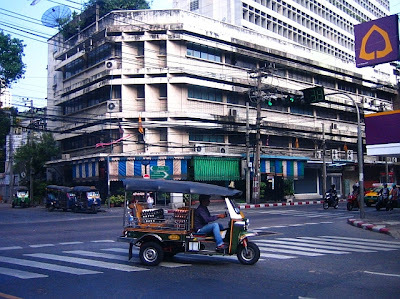 bangkok does not stop to fascinate me, the food, the shops, and how i have seen it improve and grow the past 10 years. i am always amaze at how their traffic has improved. my only question is--why do they not take effort to learn to speak english? and they can still manage, though. Oh, gosh! grabe naman yung chicken with lots of chili! Makakain pa ba yan? I'm not fond of spicy foods, so I think I'll be having a problem if ever i get to visit Bangkok. Magbaon na lang siguro ako ng de lata.. hehehe. I'm super excited to visit Bangkok later this year!! I will of course, make your blog a reference! Hihi.. Thanks! :) Will link you up! Ah your food photos look absolutely beautiful. We now have two Thai restaurants here in Cagayan de Oro but the one I've tried doesn't have such a varied food selection. I've really been harking to try more original Thai dishes with all the spice! Great post...Thanks for sharing the backpacking tips for Bangkok...I never visited it...Your pics are awesome...But the pics of foods are really good..